Although the What's Good at TJ's team has seen one or two coconut macaroon offerings before, we've seen a whole slew of salted caramel or "sea salt and caramel" products. I'd say it's getting up there with cookie butter, mango, and pumpkin spice in terms of what I'll call Trader Joe's brand "identity flavors." 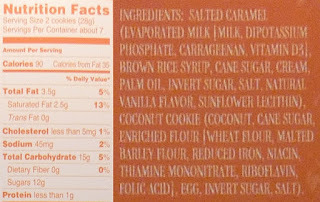 And it's great to have these "safe" stand-by type flavors always around—ones you know TJ's routinely gets right. But I personally feel like it gets harder and harder to impress me with the same flavors over and over again. I'd rather see something bizarre, even if it's a little risky. And I know it's a completely different medium and has nothing to do with what I'm talking about here, but it's the same principle that makes Stranger Things a superior production to Fuller House in every way (even though Netflix knew I was going to watch each and every episode of that zany Tanner family like I did circa 1990). So logically, as Netflix and Trader Joe's are both well aware, the best course of action is to offer safeness and weirdness side by side. Predictably, I gobbled up a couple of these cookies right after unboxing them. They're good. 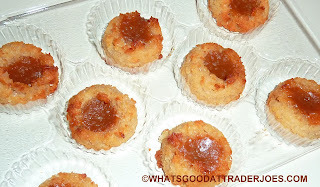 They're moist, coconutty, and sweet. 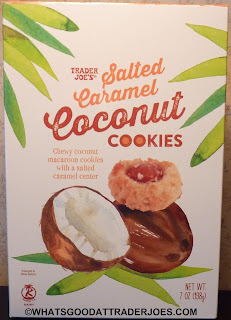 There's a significant glob of caramel right in the center of each cookie, and it adds a nice extra bit of creamy texture to the coconut shavings, but I'd still say the "salted caramel" flavor is wanting. Sonia agrees. She tasted very little caramel, and insists that there was practically no salty flavor at all. Maybe we're being picky...or maybe that salted caramel bar is just too high for us now. 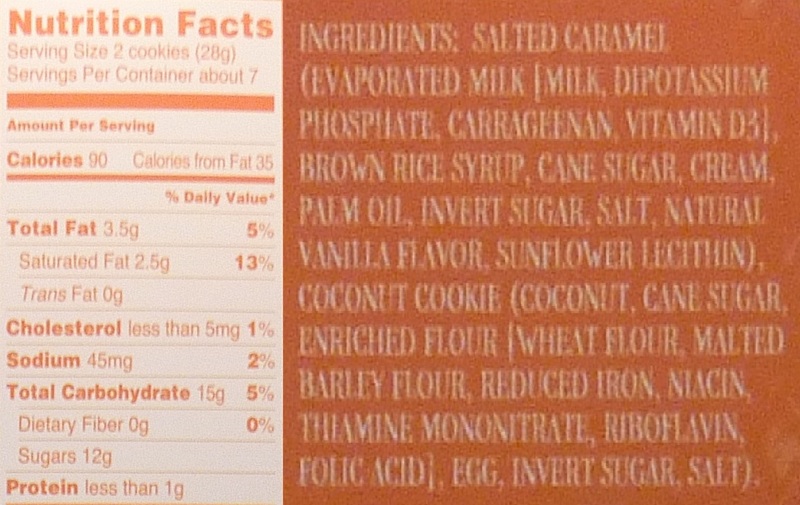 More impressed with the coconut macaroon part of the cookies than I was, Sonia says she would buy these again. I, personally, wouldn't. I don't regret buying this box, however, and I'd recommend coconut macaroon fans check them out. I'm in for three stars on this one. Put Sonia down for four. I absolutely LOVE these cookies! They are kind of like really awesome macaroons with a little dollop of very lightly salted caramel in the middle and they are super low in fat so I can eat a couple without feeling any guilt at all.